PennsylvAsia: "Japan 2019: Outlook and Challenges" with Deputy Counsel General of Japan's Ministry of Foreign Affairs Koji Abe, February 20 at Pitt. "Japan 2019: Outlook and Challenges" with Deputy Counsel General of Japan's Ministry of Foreign Affairs Koji Abe, February 20 at Pitt. 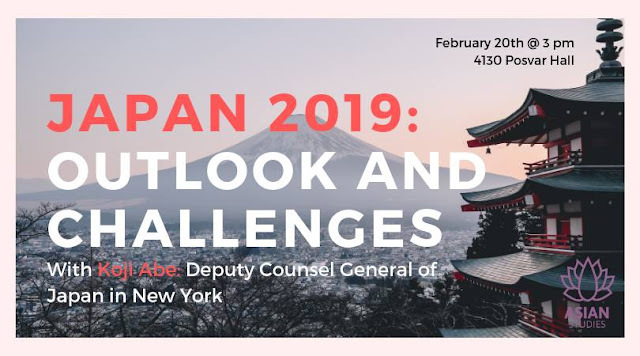 The University of Pittsburgh's Asian Studies Center will host Deputy Counsel General of Japan's Ministry of Foreign Affairs Koji Abe and his talk "Japan 2019: Outlook and Challenges" on February 20. Deputy Counsel General of Japan's Ministry of Foreign Affairs, Koji Abe will be discussing the current situation in Japan and challenges to come. He will consider Japan's relations with East Asia and South Asia, as well as the US-Japan alliance. He will examine the USJTA and TPP, grassroots activities in Japan, and other political, social, and economic aspects of Japan. It will be held from 3:00 to 4:30 pm at 4130 Posvar Hall (map) and is free and open to the public.